Last weekend I attended a vegetable gardening workshop held by our local Mississippi State University Coastal Research & Extension Service on Popps Ferry Road, Biloxi. 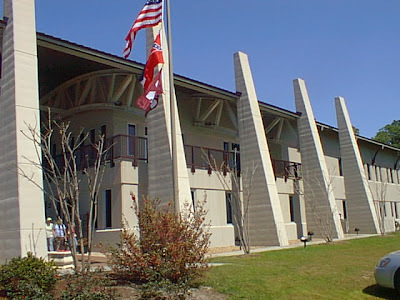 This is one of 3 workshops, so if you happen to live in the south Mississippi area and would like to attend the next ones, they are scheduled for April 4th and May 9th, from 9:00 a.m. to noon at the Popps Ferry office. The April 4th topic will cover pest and disease management, watering, mulching, composting and basic garden maintenance. The workshop for May 9th will cover harvesting and how to can and freeze your bounty! Cost to attend is $5 or you can bring 5 non-perishable food items to cover your admission. Our Mississippi Extension Service website is located at http://msucares.com and is just packed with loads of pdf documents and web pages on topics such as vegetable gardening, mulching, gardening in general, how to grow the best tomatoes, and much, much more. If you're not local to my area, be sure to go online and check out your own state or local county extension service. This was a gardening basics workshop, so much of the information was the 101 stuff, some of which I have learned the hard way through trial and error over the years, but I have to say that I did also learn a few new things! I thoroughly enjoyed going and was so excited to see that not only did they have many, many more people than they had anticipated based on previous years, but also that there were people of all ages in attendance - from the elderly to very young children and every age in between. Looks like home vegetable gardening is back in vogue! 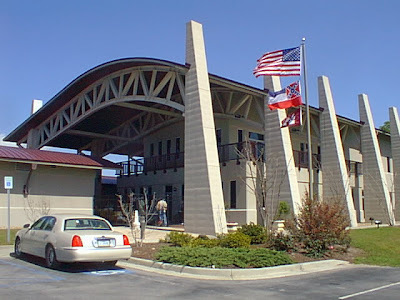 This was my first time visiting the MSU Coastal Research & Extension Services office. I love the architectural style and lines of the building. And look what a simply beautiful day it was too! 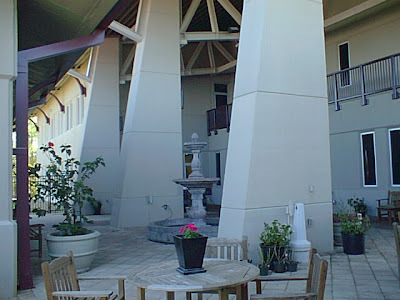 This is the open courtyard area, which I bet will soon be filled with beautiful spring flowers and the sound of that gorgeous fountain flowing! 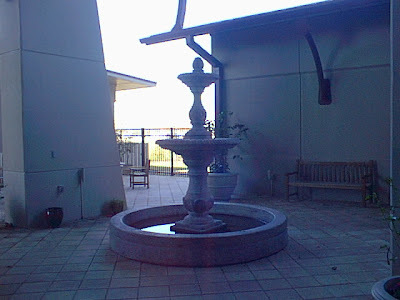 This is the other corner on the back side of the same fountain in the courtyard. There is a wonderful breeze that passes through here so I can imagine what a peaceful place this is to get away from your desk, sit quietly and eat your lunch on a pretty south Mississippi day. 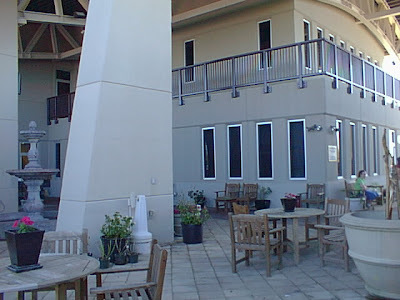 Just another angle ... can you tell I loved the courtyard? I just love the lines of this building! 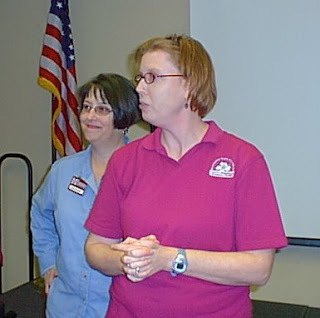 Below is Nancy Freeman, our County Extension Director for Harrison County (where Biloxi is located) with one of the speakers, Dr. Christine Coker, who they call the "Veggie Doctor." Here they were engaging with some of the workshop attendees. It seems odd to call Nancy Ms. Freeman - so I'll just say Nancy! She is a regular on our local television news station WLOX, usually cookin' something up in Nancy's Corner, so be sure to click that link and check out some of her yummy recipes! Anyway I see Nancy so often that it's almost as if she's a good friend! I'll bet that's annoying to folks who are on tv all the time because while we see them all the time, they still don't know us from Adam when we go up to them and act like we've known 'em all our life! Comes with the fame I suppose. This was the only other speaker I managed to get a picture of for some reason - although I brought my old little point and shoot and not my dSLR Canon (which is why these pictures aren't the best), I still didn't want to be intrusive or distracting with the camera. Anyway, this is Cindi McDaniel, who is one of the Harrison County Master Gardners. Anyway, she was so funny that I had to get a picture of her. Course, I suppose her sense of humor doesn't exactly translate well in a photo now does it? Nancy was the host or emcee, or whatever the proper name is to use as 'she who opens the workshop and introduces the speakers, and keeps them on point with their time and such' while trying at the same time to politely keep the audience on check with their manners as well. 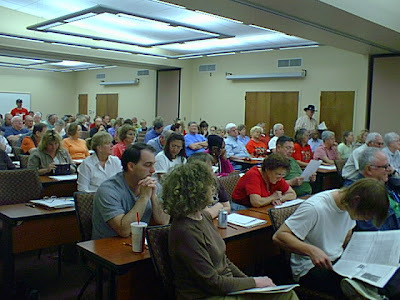 And as you see here below, it was quite a packed house! Standing room only actually - that empty seat you see is my seat because every seat was taken and the overflow was so heavy that they actually ended up having to open another room and rotate the speakers from room to room. Isn't that great?! 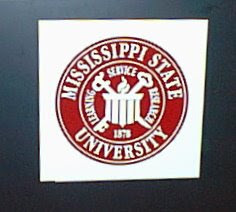 Dr. Wayne McLaurin, Visiting Research Professor from Georgia: Soil Testing, Choosing Sites and Soil Fertility & Composting. 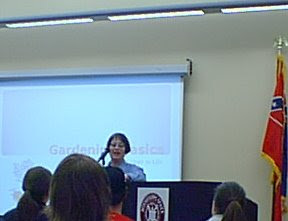 Cindi McDaniel, Harrison County Master Gardener: Basic Garden Tools. 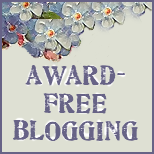 I thought I would pass on some of this information to my regular readers since gardening season is upon us and I'm writing a basic gardening series for the blog as I build my gardens this spring. Now ... as a disclaimer I must say that these tips are based on some of the written materials we received in the workshop and my notes and recollection, but I've also added here (as I tend to do) some of my own general knowledge, experience, observations and opinions. None of what is written here is verbatim by any means, so if there's something off, well ya can't blame the speakers because it just might be my opinion you're readin'! 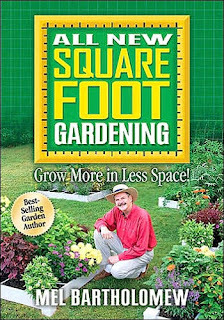 Here are my two primary gardening books - I highly recommend both but especially the "new" square foot gardening book, if you want to try this method. 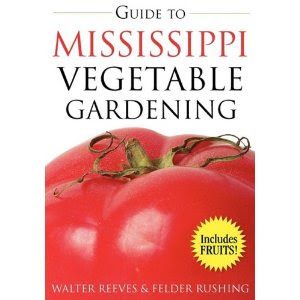 Guide to Mississippi Vegetable Gardening - available for your state too! It's a perfect guide to tell you what to plant and what works best in your region, and also when to plant. I love this guide! Vegetables require sun, plain and simple, so if possible, select a site that receives a full day of sun. You can get by with a minimum of 6 hours if your site areas are limited, but select a spot that receives its primary sun in the morning and shade in the evening if that's the case. This will help with drying the morning dew quickly off of the plants. A great home yard solution is a raised bed that is set on top of the existing soil. It produces twice the yield as a traditional garden, it's easier to reach the plants, the soil is not stepped on and thus, compacted, it has fewer weeds because you are creating your own soil mix and the soil in a raised bed warms up faster so you can plant earlier! Keep your raised beds 4 feet in width and as long as you like! If you keep it at 4 feet wide, you can reach in the bed from any side without walking on the bed. As far as depth, a foot is great, my square foot gardening book says 6 inches is sufficient, the extension officer said 8 inches I believe so I'd say that somewhere between 6 to 8 inches is probably fine. Once a site for your raised bed is selected, remove or kill all of the weeds. Don't just build your bed on top of weeds and grass because they WILL find their way up to the top. Use naturally decay resistant wood such as redwood, or cedar. Pine works also but will rot eventually. Avoid treated wood because if it does deteriorate and break down, the chemicals will leech into your soil and your vegetables. Best to avoid in my opinion. Plant your rows so that they run east to west - NOT north to south. This provides more sun over all of the plants over the course of the day and avoids overshading from neighboring taller plants as the sun moves. Keep your site close to your house if at all possible. This way you can keep a closer eye on it for pest and weed control and it is more easily accessible to both tend to and harvest from! You will need a nearby water source since vegetables do need frequent watering. The best watering method to use is some form of drip irrigation - drip tape or soaker hoses work great, though you can use cup watering as well, however it is substantially more work to cup water! Trust me. I know this. Try to avoid overhead watering with a sprinkler or hose spray if possible as this wets the foliage and can contribute to fungus and disease and probably does not water the plants deeply enough. If you have to overhead water, do it early in the day so that the sun has time to dry the plants well. Good drainage is essential since no vegetable likes wet feet! If using rows, create hills. 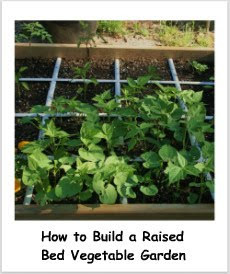 Better yet, used raised gardens if possible and the water will naturally drain down and out underneath the raised bed. If you can insert your finger into the soil up to the first knuckle and the soil is dry, you need to water. If the dirt is damp, no need to water. Don't get ambitious and overplant, unless you intend to carry them to the farmer's market or give away a lot of what you plant. Try to keep your planting area only to what you need. The best thing you can do for your garden and yard is have your soil tested. This will give you a lot of information about how to treat your soil and can be done by collecting and sending soil samples to your extension office. For instance, tomatoes, as one of the most popular home vegetable, require a pH of 6.5. In South Mississippi soil generally is between 5 and 5.2. A pH of 6 is ten times more acid than 7; a pH of 5 is 100 times more acid than 7. Only soil testing will tell you how to correct acid levels. When lime is recommended, be sure to use a garden lime, the type that is a combination of lime and magnesium together. The first number you see on fertilizer represents the Nitrogen levels. This is for greening up your plant. The 2nd and 3rd numbers are for rooting and fruiting. Your initial fertilizer should be applied before planting and give a hefty boost of nitrogen for plant growth. All purpose Miracle Gro (24-8-16) plant food, which is high in nitrogen, is a good product to use here, however once you begin to see blossoms on your veggies, it is time to fertilize again, but using a more appropriate balanced product this time. Using too much nitrogen at this stage will cause your plant to go dormant and you may end up with a large very green plant, but with no fruit! Leafy vegetables need a 1:1:1 ratio of nutrients; for instance 8-8-8 or 13-13-13. Most vegetables need a 1:2:2 ratio, such as a 6-12-12. Most fruiting vegetables need a 1:2:3 ratio such as 5-10-15. Time release fertilizer is a good option for potted plants. Oh and for a standard large garden pot, only one plant per pot. When treating for pests, sevin is very effective, however, it is deadly to bees, and bees are very important pollinators of tomatoes and are in danger right now from the use of pesticides. To protect bees, apply sevin dust only in the evening, when bees are done with their work for the day. The sevin will have time to break down overnight before the bees get back to work in the morning. Bacterial wilt is generally a soil issue! Another good reason to get your soil tested. 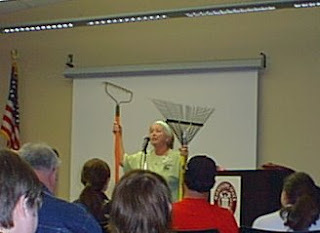 Basic garden tools that are good to have (according to your budget) are a good pair of garden gloves, a hat and sunscreen (though that tip came from our first speaker, Dr. McLaurin), a rake, shovel, hoe, a garden stool, knee pads and/or a kneeling pad or stool, a lopping cutter, hand cutters, shears and trimmers, to name a few. Really you can spend a little or a lot, but one thing that I've learned in my 51 years of life is that EVERYTHING goes better, and easier, when you have the right tools. And, frankly, it sure reduces your stress level. Invest in some good tools and take care of them. You can take your shovel to your local lawn mower repair shop and get it sharpened. I had no idea! And, I hear that they are sometimes real receptive to doing this if you happen to show up with a dozen doughnuts, oh, say like Tato-Nut doughnuts from Ocean Springs perhaps? (Oh my gosh are those good!) It is however, imperative that you keep your newly sharpened shovel away from husbands who do not appreciate them and tend to abuse them on concrete and rocks. One of the best hoes is the Rogue Hoe brand. Made from recycled agricultural disk blades, each hoe features extremely sharp edges on all sides and can be found at some local garden shops and nurseries. They can be found on the internet here. The small cell packs of multiple seedlings are really just a good as the larger, much more expensive seedlings. You're certainly getting a better start with the larger more developed plant, and if you can afford that extra cash by all means go for it. But, the smaller, much less expensive packs are gonna produce the same plant over time, so if you need to save a little money (and who doesn't these days), then just go for the less expensive cell packs. Most typical home garden vegetables do well in south Mississippi and those standard to most home gardens are tomatoes, melons, pumpkins, summer squash, zucchini squash, sweet potatoes, okra, sweet peppers, hot peppers, eggplant, pole beans, sweet corn (though figure on only one ear per plant), leafy greens such as lettuce, spinach, beets, cabbage, mustard and turnip greens, southern peas, and cucumbers. Asparagus does not perform well here - it needs a much cooler climate than we have here in south Mississippi. There are 2 types of tomatoes, determinate which reach a certain height and then stop growing and indeterminate, which keeps growing much like a vine. The majority of tomatoes are indeterminate. Tomatoes can be planted deeper in the soil than other vegetables which gives them more strength and stability. On the bottom of the stem you'll see what looks like tiny roots protruding out. That is normal, and you can plant them to just above those roots - generally an inch or so with no problems. Other vegetables must be planted even at soil level. 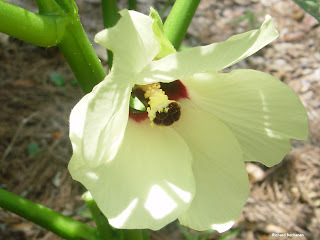 Okra comes from the same family as the hibiscus plant and so it produces a very pretty bloom. If your space is limited and you have a full sun flower bed, they make a perfect companion in with the flowers! Isn't that pretty? I was so excited to hear this and I guarantee you that I have a sunny, southern exposed flower bed that is gonna have some okra growin' in it this year, provided I can find the seeds that is. A good soil mixture should include some top soil, humus and manure. This year, I'm using Mel's Simple Formula Mix from All New Square Foot Gardening of 1/3 blended compost, 1/3 peat moss and 1/3 vermiculite by volume. Certain flowers such as marigolds are insecticidal and make great companion planting along with your vegetable garden, but remember, veggies need pollination, so use all kinds of flowers around your veggie garden to attract those bees and butterflies! Go here to find out more about how to select plants for pollinators and attract them by your specific eco-region. Well, hope you enjoyed this little primer on veggie gardening. Be sure to stay tuned for more tips from me as I delve into the garden as the season goes on and don't forget ... check into your own local or state extension service for soil testing, weed identification and loads of agricultural information! And of course if you're local to the Mississippi Gulf Coast, there are two more workshops coming up. Be sure to check it out. Well, we aren't out of our danger period quite yet for a last frost but that'll be soon. I'm not sure being early is a blessing though LOL... I'm happy to see green for sure - all the buds emerging, all the plants starting to peek out from the ground - heck I've been running a sprinkler the last 3 days! All that's exciting for sure, but it'll be hot as Hades before too long so even though we get an early start it's kinda short-lived before the heat pretty much melts everything (including ME)! Wow perfect timing!!! I just bought my seeds. Going to try a raised bed this year. Hopefully that keeps the dogs out. Thanks for all info. I'm pretty new to gardening so I can use all the tips. Great! That's exactly what I was hoping for!! Hope that you find some useful stuff along the way. Hi Tanya! That's actually the best way to get a headstart anyway, by getting the seeds going inside. And what a great way to teach the kids about how food gets to our table too! I can't do that with my cats - they eat every plant that I try to bring in the house! I'd have to start mine with a grow light in the garage or a closet LOL! Yeah I really did enjoy the workshop. Can't wait for the pest control part because that is what I have the biggest problem with down here. It's really still a bit early for us to plant outside just yet because we are not out of the frost danger zone yet, but still our winters are pretty mild so it's cool to see some of the perennials starting to peek up from the ground right now. Check your local county extension office to see if they have any gardening workshops near you - it's our tax dollars at work ya know?! Just google for your area/county extension service office.